As you know I love to celebrate. Over the years Erik has learned to be prepared when his birthday comes around. Yesterday was his birthday and he had two requests. 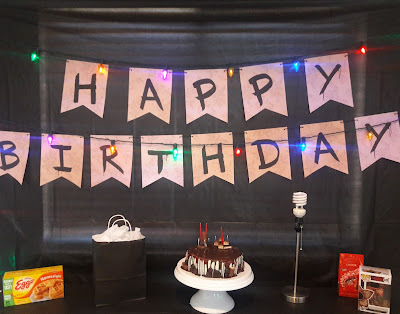 One: That his party was Stranger Things themed. Two: That he had a mint chocolate cake. To start the party off right I placed a print out of Will's missing person poster in our entry. For the backdrop I HAD to do the alphabet wall and Christmas lights. Instead of the entire alphabet I spelt out Happy Birthday. I was originally going to get a brown patterned tablecloth and hand paint the letters onto it but came across this printable alphabet banner online for $7! I decided to save myself some trouble and go that route instead. I love this banner because you can choose to print it with or without Christmas lights. I chose without and hung our own Christmas lights we use on our house each year. I placed the banner and lights in front of a black tablecloth since everything is dark in the upside down. In front of the background I set up a table with another black tablecloth. On top of the table we have a box of Eggo's, Erik's present from Scout, his mint chocolate birthday cake, a lamp missing it's lampshade, and a Funko Pop Demogorgon guarding a bag of Erik's favorite truffles. I love that you can use things from around the house for decoration. In our family room I set up a fort in front of the TV. Will has a fort in the forest behind his house and Eleven has a fort she hides in at Mike's house. 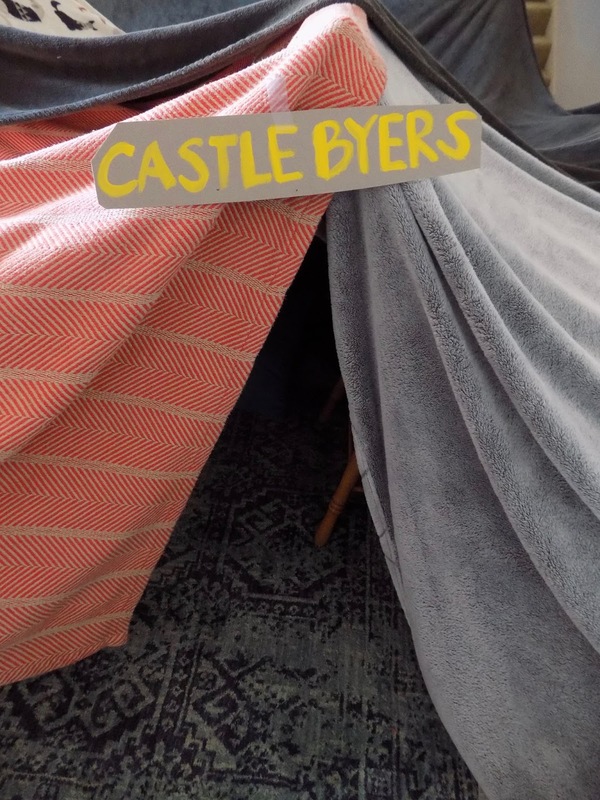 I used yellow paint and some cardboard to create two hand painted signs that read "Camp Byers" and "All Friends Welcome" to copy the signs outside of Will's forest fort. I placed these at our fort's entrance. Since Erik and I were the only ones celebrating I made just a few snacks for us to enjoy. I tried to find mini Eggo's at the store but was unsuccessful. I bought the regular sized Eggo's and used a small round cookie cutter to create smaller Eggo's for our sliders. I stacked three on top of each other and placed a toothpick in the middle. You can enjoy them plain or dip them in peanut butter, Nutella, chocolate whatever you desire! I taped the empty Eggo box back up once I was finished and used it for decoration. Our second snack was pudding. Because their lunch lady be hoarding it! I set packs out on a tray with some spoons. We topped them with crumbled Oreo's to make it look eerie like the upside down and enjoyed! If you are entertaining a large group a waffle bar would be an awesome option. If you have a smaller group Eggo sliders are the way to go! Every year I get Erik a bag of Lindt Lindor Truffles since they are his favorite. I wanted to add in some red to the party to match the title and decided they would do. I made a homemade chocolate cake with mint frosting per Erik's request. I was originally going to put the Demogorgon on top of the cake but wasn't sure if Erik would want to keep it in it's package. The cake didn't seem to fit in with our theme without the Demogorgon so I decided to turn it into a drip cake and added a chocolate ganache on top. 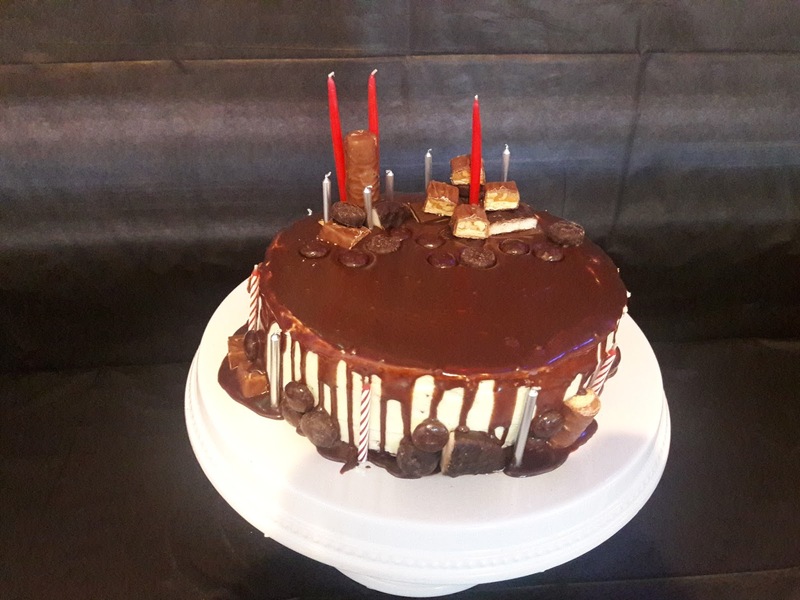 The chocolate drips down the side were the perfect touch. It gave it an upside down feel. 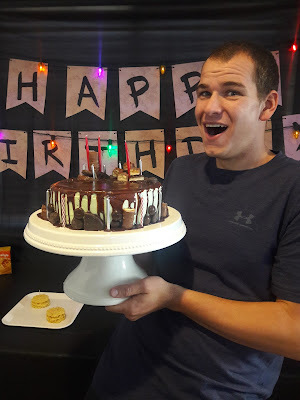 I topped the cake with some of Erik's favorite candy, mint candy to compliment the cake and red and silver candles. I had the Clash's Should I Stay or Should I Go playing when Erik got home. Then I popped out and sprayed him with silly string. The silly string is a traditions of ours. I found a playlist on YouTube of all of the songs from season one and let it play while we opened presents and ate cake. I have linked it above or you can create your own if you'd prefer. Erik and I watched the last few episodes of the first season of Stranger Things in our fort while eating Eggo's last night. I truly feel like there is no other way to watch the show now. We will be binge watching the second season in there all weekend. How will you be enjoying Season Two? Good one! It is always a great idea to have a theme for a party. The decoration gets simplified and it is pretty much fun. Lovely post and Happy birthday. I wish I could also celebrate my birthday at home but it is under renovation right now and I will have to look out for one of the nicest LA event venues.